Innovative fantasy and imaginative magic collide in author Logan L. Masterson’s third tale of his Pro Se Productions Single Shot Signature Series, Canticle of Ordrass: The Wheel of the Year-Beltaine. Davia Mollari and the other Priestesses face a spreading darkness. When Davia decides upon a brave course of action to defend the village from those who pursue her, Mairi risks her life to ensure success. Before summer is welcomed at the village bonfire, Rangers, Priestesses and Inkeeps will test their limits to protect both the blooming Maiden-Sister and restore peace to pastoral Matharden. Canticle of Ordrass: The Wheel of the Year-Beltaine is the third short story in Logan L. Masterson's Pro Se Single Shot Signature series of digital singles from Pro Se Productions. Born in southern Missouri, and traveling the American southwest throughout his early life, Logan L. Masterson rooted himself in ideas rather than places. His world is a place of wonders, where words are magic and anything is possible. It’s also a place of darkness: good things happen to bad people and the best intentions can go terribly awry. Logan L. Masterson is the author of Ravencroft Springs, a Lovecraftian tale of Appalachia published by Pro Se Press, as well as Feast of ’69, a Ravencroft Springs Single Shot digital single. Look for his stories “Clockwork Demons” in Capes & Clockwork and “Shadow of the Wolf” in Luna’s Children II, both from Dark Oak Press. Masterson’s flash fiction “Escaping Atlanta” appears in Rat-A-Tat: Short blasts of Pulp from Pro Se. Masterson is also a published poet, arts journalist, editor and unapologetic geek. 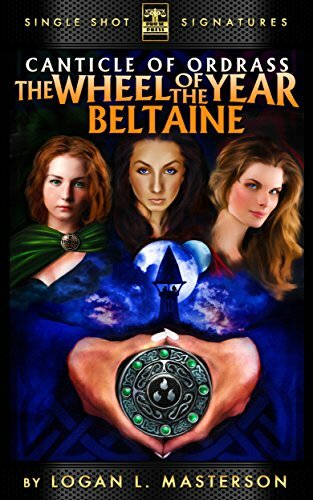 Featuring an atmospheric cover and logo design by Jeffrey Hayes and eBook formatting by Russ Anderson, Canticle of Ordrass: The Wheel of the Year-Beltaine is available for the Kindle at http://www.amazon.com/Wheel-Year-Beltaine-Canticle-Ordrass-ebook/dp/B00WFNMRJC/ref=sr_1_1?ie=UTF8&qid=1429671564&sr=8-1&keywords=beltaine+masterson and for most digital formats via Smashwords at http://www.smashwords.com/books/view/537051. STORMY SECRETS REVEALED IN 'HISTORY OF FLIGHT-FLY GIRL BOOK FIVE' FROM PRO SE AND RUSS ANDERSON, JR.!